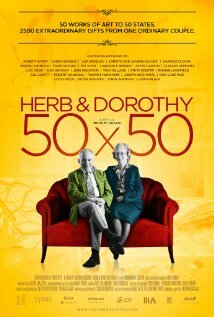 Fine Line Media releases Herb & Dorothy 50x50 at IFC Center on September 13th, 2013. NYC MOVIE GURU: How did the the sequel to Herb & Dorothy come to you?? Megumi Sasaki: The 50x50 project came a few months before I finished the 1st film. Obviously, I couldn't include it in the film, but I threw in a card explaining that this is the new project. At that time, I wasn't thinking about making a sequel. I was just totally exhausted. 6 months later, we went to Indianapolis and then all of the recipient museums have to have Vogel exhibitions within 5 years of receiving their [artworks] gift. So, Dorothy and I were invited there to shoot---maybe for a DVD extra or something additional. I didn't think it was going to turn into a full-length feature at that time. When I saw the exhibition for the very first time, I didn't realize that I didn't see the Vogel's collection in a museum setting, properly framed, lit and curated. I felt like I didn't know anything about their collection back then. Dorothy Vogel: Doing the first film, Megumi had no idea about the 50x50 because it was hush-hush. It was finally decided on about to do, but it was too late for it to be in the film, but at the very end of the film you can see a message about it--a card. NYC MOVIE GURU: What was it like releasing Herb & Dorothy in Japan? Were there any challenges to find funding for the sequel? MS: No distributor in Japan was interested in it because it's not a Japanese film, contemporary art is a very niche market, and documentaries in Japan aren't considered something that people pay for to see in theaters. Nobody wanted it, so I self-distributed it. A group of volunteers helped me to distribute it, but it happened to be a huge success. My documentary is very positive, but most documentaries are about war or poverty, which is while it was hard to find funding. NYC MOVIE GURU: How did you find the right balance between entertaining the audience and provoking them emotionally as well as intellectually? MS: The first film was more about the human story. It was about Herb and Dorothy's passion, love and way of living. The sequel is more about art because that's what I'm more willing to seek the answers for. Structure-wise, it's more like a tapestry about art and their life. I'm very lucky to have a very good editor and she totally understands my vision, so we hardly ever disagree about anything. NYC MOVIE GURU: Dorothy, what do you think makes you and Herb truly great art collectors? DV: I think we're at the right place at the right time with the right information. The Gods have it all lined up for us. I really believe in faith. It's destiny. Things were too easy: everything just fell into our lap. We took advantage of all the opportunities that we had. NYC MOVIE GURU: What message would you like to leave to the young generations of Americans who are addicted to video games? DV: I just hope to inspire people to appreciate art even without a fancy background in art. You don't have to understand the musician's techniques when you go to a concert. I never took an art history course in my life. I learned about art by looking at art, not by looking at it in a book or in slides. MS: Video games are something that you're enslaved and trapped into, but art is something that frees your heart and soul, I think. Art does not require explanation or verbalization; art is something that you experience with an open heart. You don't need money or an academic background to appreciate or to enjoy it. The reason why Herb & Dorothy resonates with so many people beyond the art community is that their story really speaks for everybody. That's a testament to the fact that art is for everyone. NYC MOVIE GURU: Why don't you like discussing how much you paid for the artworks you collected? DV: First of all, I don't usually remember how much we pay. I can remember facts, but not numbers. I never put a monetary value on art because it's not important to me and Herb. NYC MOVIE GURU: If there were a biopic about your life, which actress do you imagine play you? NYC MOVIE GURU: Who would play your husband? DV: Danny DeVito. He's a short little man. MS: I think Dustin Hoffman should play him. NYC MOVIE GURU: Which actor would play your husband? MS: I wouldn't. I don't want to deal with actors.